Love Olive Garden? 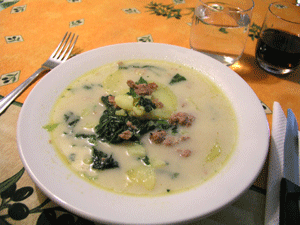 Have you had their delicious Zuppa Toscana? Link over and get the recipe. One of my friends shared this with me, and I just have to share it with the rest of you! I made it but with a slight variation. I'm not a huge sausage fan so instead of the sausage I used 1lb ground turkey with 1-2 Tbsp Paprika and 2 tsp garlic powder mixed in. Also - I just used Whipping Cream (not heavy) and halved the amount called for. It really didn't need so much to taste amazing. I've recently discovered that the bacon bits expand a little too much for my taste by the next day. (As in you will find large fat chunks in the soup.) My recommendation on that is to either use your own cooked and crumbled bacon or to use bacon bits on the side and not actually in the soup.